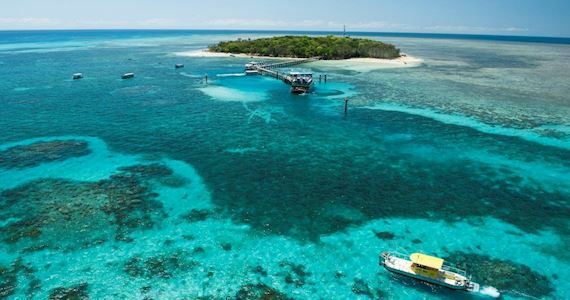 Our Cairns Reef half day tour allows you to enjoy the beauty of Green Island, part of the Great Barrier Reef with a half day reef tour departing from Cairns. Choose to snorkel, dive, stay dry or view the spectacular underwater reefs in our semi submarine or glass bottom boat, or simply laze on the white sandy beach. These are only a few of the many reef and island activities available at Green Island. Our friendly crew will help you to organise your activities to make the most of your time on Green Island. Green Island, a Marine National Park is a beautiful coral cay on Australia’s Great Barrier Reef. Green Island boasts unique rainforests, surrounded by white sandy beaches and magnificent coral reefs and abundant marine life. A half day reef cruise departing Cairns at 9.00am allows 2 hours on Green Island and arrives back in Cairns at 12.45pm. “Reef Rocket” is a modern comfortable air-conditioned high speed catamaran with a relaxed atmosphere. Travel time to Green Island is 45 minutes from Cairns.